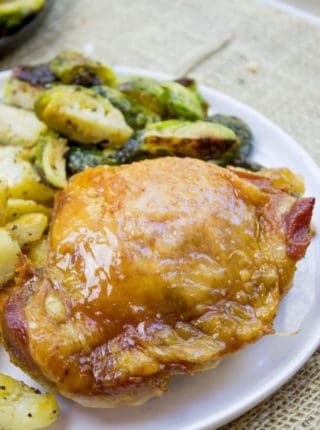 Easy Roasted Turkey Thighs make a small Thanksgiving meal a one oven dinner. Tender, browned, crispy skin and easy to make, they’ll cook quickly! Easy Roasted Turkey Thighs cook in a single baking pan alongside three other dishes in one oven making your whole Thanksgiving meal easy enough to cook in one oven. I love easy Thanksgiving meals, one of my first was Slow Cooker Turkey with Gravy, Candied Sweet Potatoes and Green Peas which was just 7 ingredients (not counting salt and pepper) in the entire meal. Then this year I released the whole thanksgiving dinner in 1 slow cooker post: Slow Cooker Thanksgiving Dinner (for 2!) with more than 7 ingredients but it includes stuffing! This dish is meant to be an easier way to make your Thanksgiving turkey! 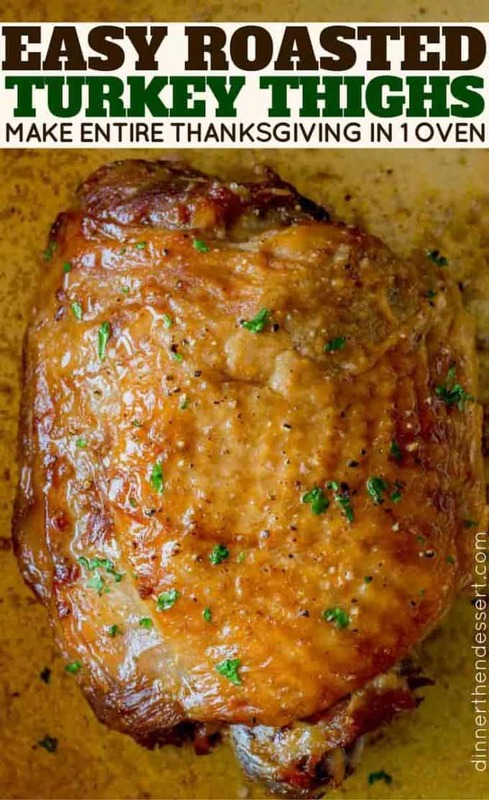 I already have posts for Crispy Slow Cooker Turkey Breast and Crispy Slow Cooker Turkey Thighs that can help when you don’t have oven space, but this easy roasted turkey thigh is the perfect oven cooked option for a small Thanksgiving gathering. Cooking turkey parts instead of the entire bird serves a few purposes. First it cuts WAY back on the cooking time. Second it allows you to cook more of your favorite pieces. Breasts and wings are generally considered white meat, turkey thighs and turkey legs are dark meat. 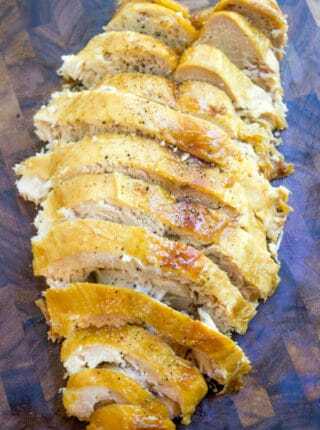 Roasting both dark meat and white meat works well, but with turkey thighs you’re able to roast longer and have a deeper browning without losing the moistness you’d want in your turkey. Lemon, garlic and rosemary: lemon zest, kosher salt, black pepper, minced fresh garlic and minced fresh rosemary will make a delicious bird, just be careful the rosemary smell can take over anything else in the oven with the turkey. Orange, cranberry: orange zest, minced cranberries, 1 tablespoon brown sugar, kosher salt and black pepper. This dish will play nicely with any oven neighbors. Truffle Butter, fresh thyme: Kick up the flavor (Trader Joe’s has $2.99 truffle butter right now too!) and slather the turkey in truffle butter, kosher salt, black pepper and chopped thyme for a rich umami flavor. Bacon: Drape the turkey in bacon along with your Kosher salt and black pepper for a smoky flavor. Tarragon, Shallots, Lemon: Fresh minced tarragon and shallots with lemon zest, Kosher salt and black pepper, this dish will perfume the rest of the oven. 9×13 pan: Keeps the liquids the turkey releases from ending up on the bottom of the oven and browns great. Oven Thermometer: Easy to test if your turkey is done and safe to eat without opening the oven to check and slow down the cooking. 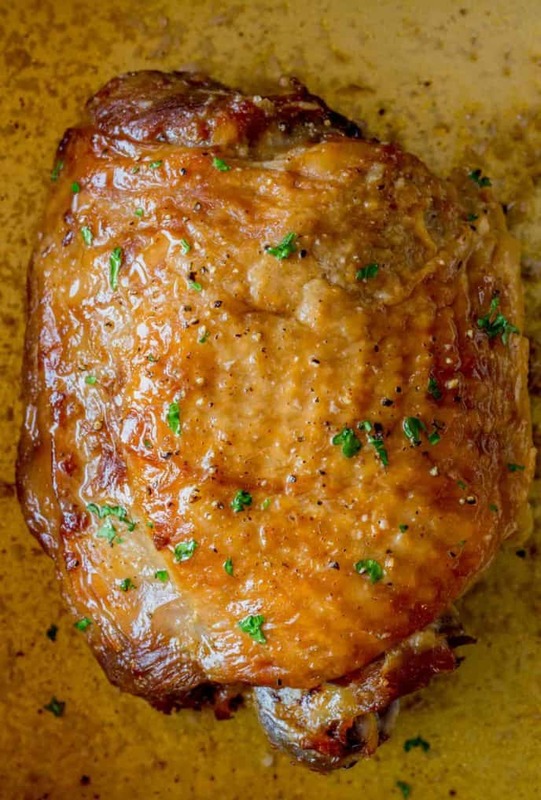 Easy Roasted Turkey Thighs make a small Thanksgiving meal a one oven dinner. 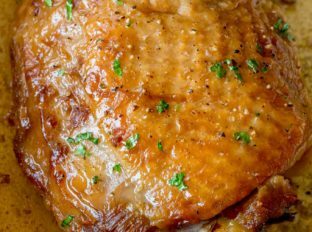 Tender, browned, crispy skin and easy to make, they'll cook quickly! Lift the turkey skin and stuff it with the softened butter, then pat it down in an even layer (gently). Place the thighs in the baking pan. Roast the turkey thighs for 50-60 minutes or until the thermometer shows the turkey is cooked to 170 degrees. * Please see additional flavor options above in the post for more variety. I wish I could post a photo. Under the skin I added fresh rosemary and chopped garlic to the butter. In addition to the salt and pepper I also sprinkled it with smoked paprika. Delicious and easy. Thank you! So sorry, I didn’t realize you were asking. Yes, you can mix it first and put it under the skin. It really does sound delicious! OMG! As a chronic “ procrastinator “ I waited until the last minute to start Christmas dinner. This was the BEST recipe. I cooked for 4 picky kids, my exhausted self and boyfriend and did easy basic sides. I cooked 4 in a 9×13 and it needed quite a bit more time ( guesstimate: 30-45min) but I should have increased the temperature for faster results, but, hey, the cook has to relax with a glass of vino for the chaos of opening presents, adjusting to a new home and the return from their other families. Nevertheless, it was a beautiful dinner! Thank you!!!!!!!!! Love it! I’m so honored to be your first review! Yes, you can roast the at the same time. Timing should still be the same. Enjoy! Will there be enough pan drippings to make gravy? Hi if baked 2 theighs an 2 legs of the turkey is 60 min to bake or would it be longer Sabrina. It might need more time but use your meat thermometer to check for doneness. Can l put stuffing under the thighs while baking for extra stuffing? Unfortunately the stuffing will create extra moisture and will steam the turkey thighs vs browning it. I would recommend making it on the side separately. So glad to hear you enjoyed it Danielle! Honestly, I would try and stick to bone in. The bone is waht protects the meat from getting dry. 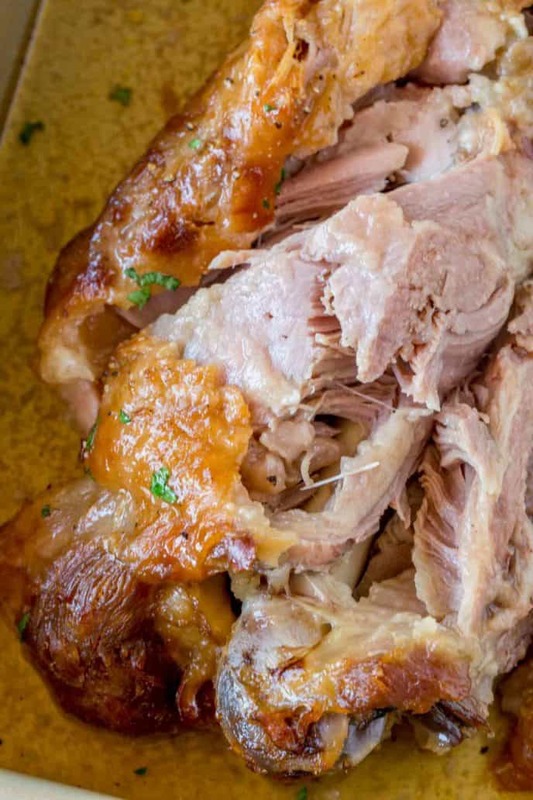 If you do use boneless, make sure it still has the skin on it and tuck it around to cover it….kind of like a roast. Going to try tonight, looks great will have mashed potatoes and peas. Yeah! These thighs looks so good! I am going to have to make them soon! My mouth is watering just thinking about this. Simply amazing! I can’t resist to these roasted turkey thighs! These look addicting and so easy! Thank you, Catalina! They are definitely hard stop eating once you start! They’re so good! This turkey looks so juicy! Yes, make sure to have napkins! haha!! That crispy skin!! OMG, totally making these soon! Love that you included a list of flavor options! 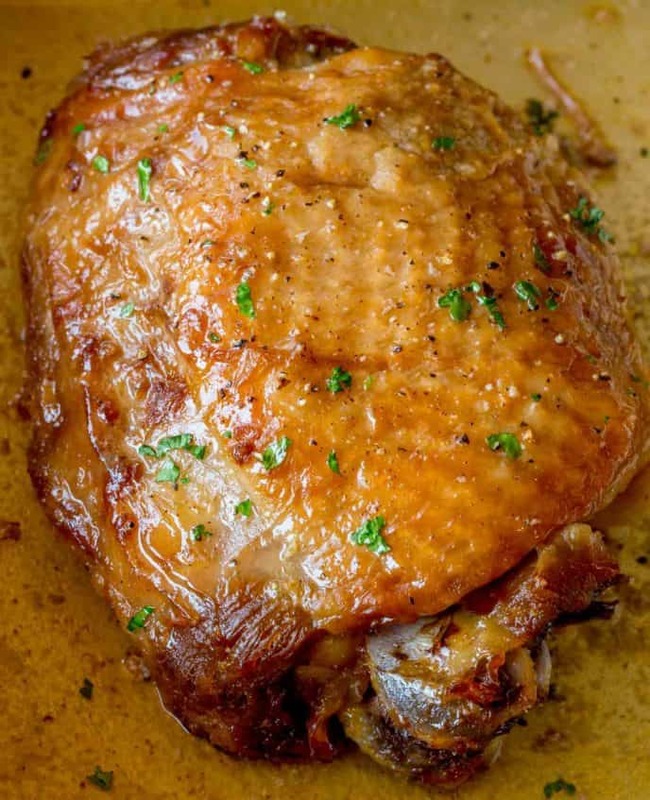 Such a great recipe — thighs are our favorite! Thanks, Jenn! The more options, the better!